Hotel du Lac is situated in the pedestrian promenade of Gardone Riviera near the berth of the public shipping line . Gardone Riviera has been a famous tourist destination since 19th century and offers its guests a special microclimate a luxuriosus vegetation and an elegant atmosphere.Large hall, indoor and outdoor restaurant a'la carte with panoramic terrace on the lake, Wi Fi are at disposal of the guests.The 39 rooms , most of them with lake view and balcony or terrace, have sanitary facilities, telephone, air conditioning/heating, hair dryer, TV , Wi Fi. 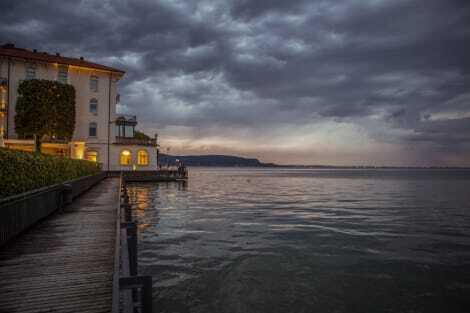 Hotel is near Vittoriale degli Italiani ,next to botanical garden Heller in front of Isola del Garda.Luxury boats are available for individaul guests and groups for ecxursions on the lake. Make yourself at home in one of the 60 air-conditioned rooms featuring minibars. Complimentary wireless Internet access keeps you connected, and satellite programming is available for your entertainment. Private bathrooms with shower/tub combinations feature complimentary toiletries and bidets. Conveniences include safes and desks, and housekeeping is provided daily. Pamper yourself with onsite body treatments and facials. You're sure to appreciate the recreational amenities, including an outdoor pool, a spa tub, and a sauna. This hotel also features complimentary wireless Internet access, babysitting/childcare (surcharge), and wedding services. Take advantage of recreation opportunities such as an outdoor pool or take in the view from a rooftop terrace and a garden. Additional amenities at this Art Deco hotel include complimentary wireless Internet access, concierge services, and babysitting/childcare (surcharge). Make yourself at home in one of the 23 air-conditioned rooms featuring minibars. Complimentary wireless Internet access keeps you connected, and satellite programming is available for your entertainment. Private bathrooms with bathtubs or showers feature rainfall showerheads and designer toiletries. Conveniences include safes, housekeeping is provided daily, and cribs/infant beds (complimentary) can be requested. lastminute.com has a fantastic range of hotels in Gardone Riviera, with everything from cheap hotels to luxurious five star accommodation available. We like to live up to our last minute name so remember you can book any one of our excellent Gardone Riviera hotels up until midnight and stay the same night.